I made a very silly hat! Also, a very warm hat. Want to make one just like it? I have plenty of yarn leftover — if you promise to make a hedgehog hat, I’ll send you my leftover Mushishi. 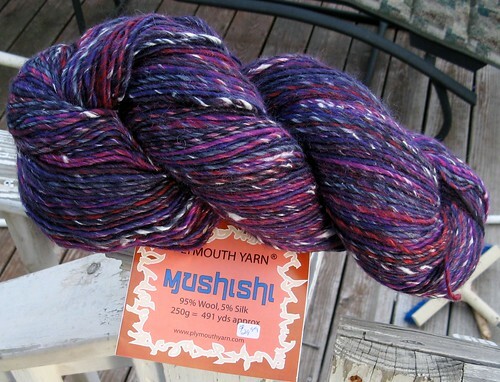 I picked up some Mushishi as a “courtesy purchase” while checking out a LYS. 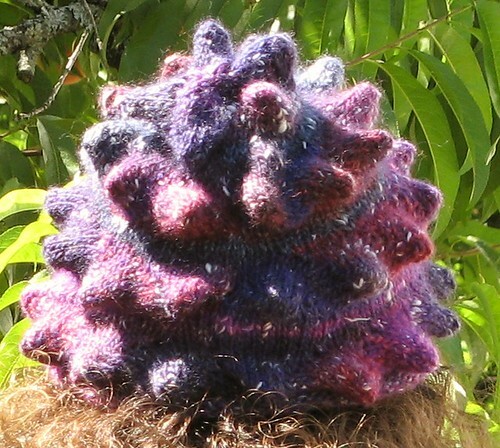 The long color changes seemed just right for the short-row hedgehog hat. I love how yarn and hat came together for this project. I know it’s not to everyone’s taste … but I love a silly hat sometimes! 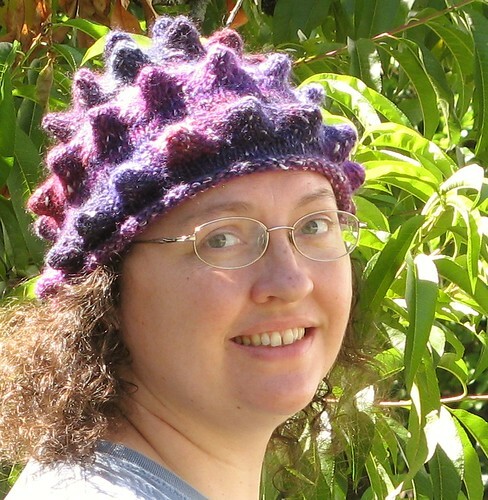 The hat is worked flat, with each bump worked as a set of short rows. For the hat you work a row of bumps, work a couple stockinette rows (decreasing the overall number of stitches), and then work a row of bumps back the other way. I definitely put my new(ish) skill of “knitting both directions without turning” to good use with all those short rows! In addition to a delightfully silly look, the bumps also trap air — this is a one WARM hat. I look forward to wearing it for more than a few minutes at a go, come this winter. 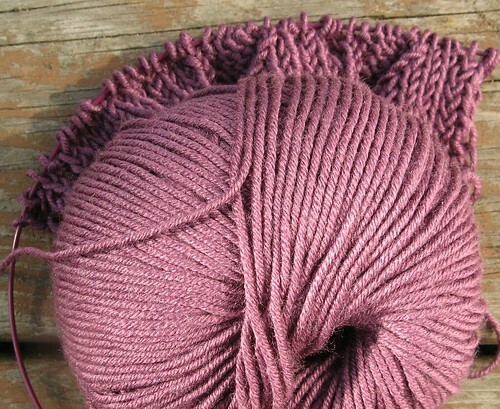 See my pretty purple sock yarn? 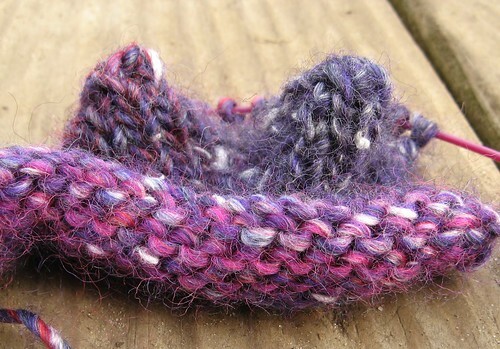 It’s Mad Tosh Sock in “Flashdance” — yum! This week I cast on for a pair of Fringe Socks from California Revival Knits (Stephannie Tallent). I’m using some ancient stash (Reynold’s Wash Day Wool in Cream) for the contrast color. I’m about to do the the fringe bit — very cool! 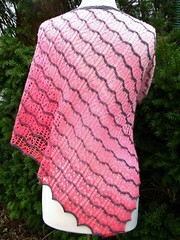 This is the Jan 2012 Rockin’ Sock Club yarn, in the “not a sock” pattern. I am thoroughly in love! 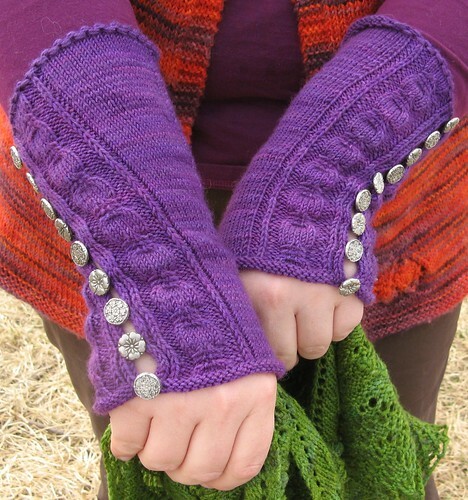 The cinched cable is delightful, and I love the buttons-as-seam closure (they are just sewn in place — the mitts do not unbutton, they just slide on). Nicely shaped wrist and thumb, high marks all around. Welcome to CO Monday, or (as it shall be known this week) “Have I Lost My Mind?” I started four new projects this week, even though I already have multiple projects already actively in progress. 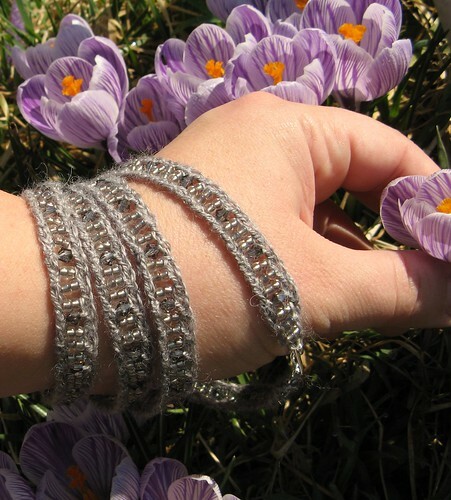 Perhaps I am crazy, and believe I have grown extra arms, and need even more projects to keep my extra arms busy. I hope those extra arms already know how to knit. I think the cause is simple: I’m getting near the end of many of those WIPs, and I’m anticipating the lull that follows — the panic that sets in when I don’t have enough projects! Eek! 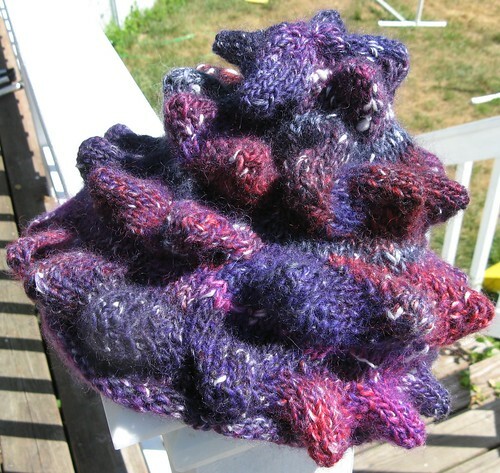 Purple Hedgehog Hat — I bought a skein of Mushishi as a courtesy purchase when I checked out Aunt Margaret’s Yarn Shop in Chelmsford, MA. The main draw of this shop (for me) is that they carry a full line of Knit Picks needles, including interchangeable tips and cables! 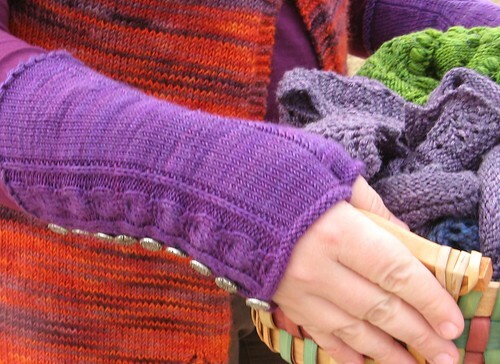 But, I didn’t need any needles on this visit, so I chose a big cushy skein of purpley yarn. It has long color repeats, but they aren’t that different from each other. I’m taking full advantage of the color repeats with the short-row bumps in this hat. I have two bumps done so far :). Next up: Berringbone Patch Socks. I haven’t made a pair of socks in quite a while. It was time. 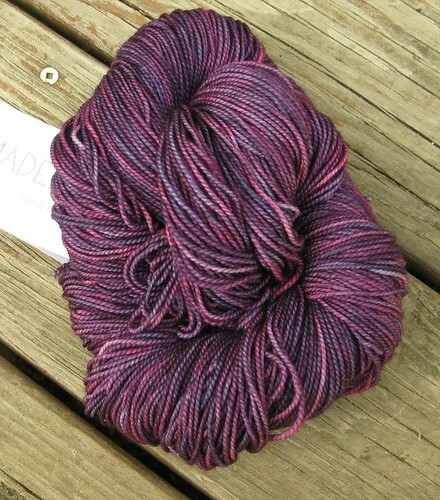 I’ve had this skein of Stroll Hand-painted around for a while, earmarked for socks … I did change my mind about the socks I was going to make, though. 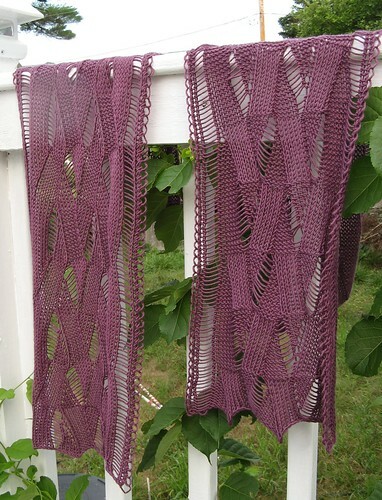 I’ve decided I really don’t like lacy sock patterns, because they don’t wear as well as more solid patterns. 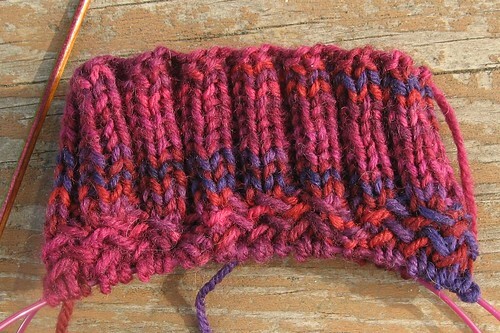 I’ve finish the cuff and gotten about four rows into the herringbone pattern. 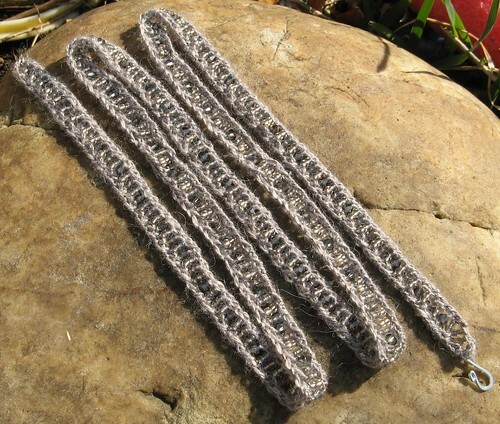 I stranded the beads and knit it up in a single day — the kit comes complete with the yarn, beads, clasp, pattern, and even a little threader to help put beads on the yarn. I give it high marks! I finished a sweater for me! This is not something that happens every day. I bought this yarn on spec back in June, at the 20th (and final) Granite State Knit-In. I’m sorry to say that a LYS had brought all their merchandise and were selling it off at 2-for-1 because they were closing their doors. 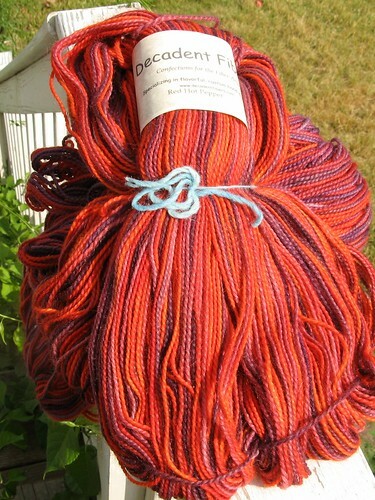 I’m glad to say I found two skeins of this astonishing fiber, each normally $35. I decided to take a leap of faith and buy both — almost-a-sweater for $35 was too good a deal to pass up. Once I had it home, it proved to be a bit of a challenge. 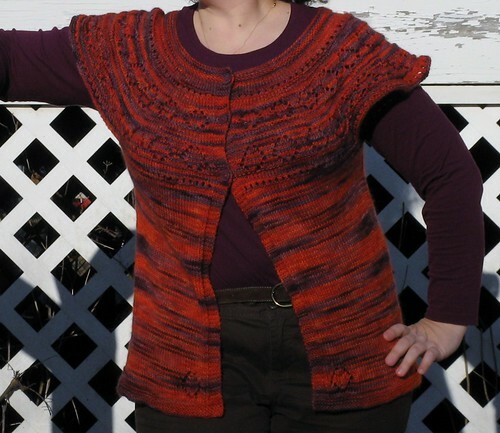 First of all, though it claims to be DK, it really feels and knits up closer to worsted. Also, it turns out that 980 yards is not quite enough to make most things, at least not in size large-enough-to-fit-me. 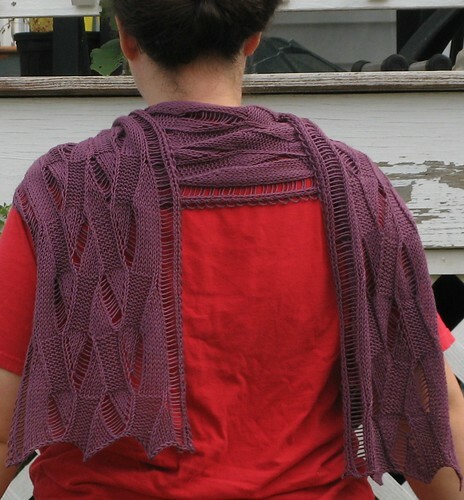 I finally settled on Tappan Zee — a pattern I queued in large part because I love the eponymous bridge! I used to drive back and forth from DC to Boston fairly frequently, and every time I saw signs for Tappan Zee it made me happy. Try saying it aloud — you’ll be happy too! Swatching told me three things: first, I should expect worsted-ish gauge. I decided to follow the pattern for a proportionately smaller size, which ended up working great. Second, blocking the swatch told me that this yarn would bleed dye something awful. This turned out to be a good thing, because the fully saturated color was a bit much — I prefer the toned-down color after blocking. Third, the fabric is also appreciably softer after a good wash-and-block, which reassured me while I was knitting — the WIP sometimes felt a bit crunchy and oh-my-god bright red and orange. Thank goodness for swatching to tell me the truth. 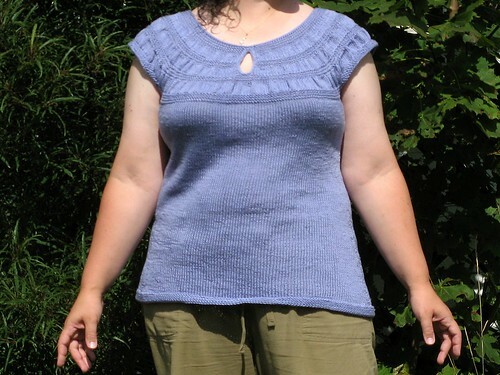 One thing I changed in the pattern was the armholes. I really hate tight, binding armholes, so instead of casting off for the arms, then bridging the gap directly, I chose to cast on a handful of stitches under each arm. I must have goofed the math a bit, because my sleeves ended up a little ruffled — too much fabric up there. It bothered me at first, but my knit group claims they like it, so I’m slowly coming around. I was about two dozen rows shy of the official “start the edging” point, when I noticed that the yarn ball hand dwindled to an ominously small size. I got out my new and wonderful super-accurate digital scale and weighed the ball before and after the next two rows … and discovered I had barely enough to finish the edging, but only if I started it RIGHT THEN. As it was, I had to rip out the swatch in order to bind off the last few inches. I think the finished cardi is long enough — any longer would have been odd, actually, which implies I shouldn’t have been doing quite so many rows in the first place. The luckiest part of this project was that I found the perfect buttons. They seem as if they were dyed-to-match — and they were cheap, and they were the first ones I saw at the shop, and they came in a set of three! 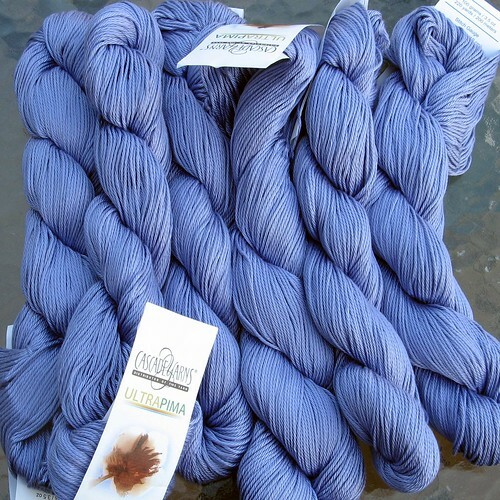 Back in June I bought some pretty pale violet Cascade Ultra Pima at Unforgettable Yarns in Andover…. 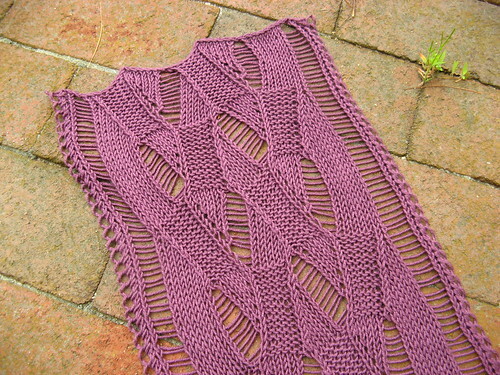 A mere three months later, and I have a new summer top! In general, a great pattern. Easy to follow, no errors (that I noticed, anyway), etc. I like the simplicity of the design. I found it to be great “travel knitting” because of the large swathes of uninterrupted stockinette. 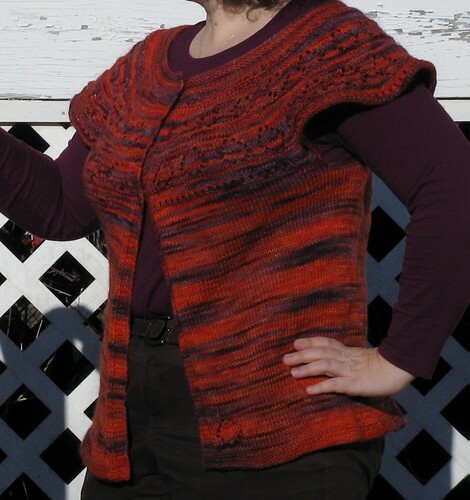 Like many other knitters of this pattern, I found the keyhole a bit too large for my taste. When I put the i-cord edge on the keyhole, I just skipped every third stitch to make it a bit smaller. I wore it as written for a single evening … and the neckline stretched from “daringly revealing” to “downright scandalous.” I solved this by adding an applied i-cord edge (matching the keyhole edging nicely), and the top is now quite wearable. One other minor quibble — for me, the CO stitches under the arms weren’t quite enough — I should have added more. As it is, the fabric stretches a bit too much there (oh well). 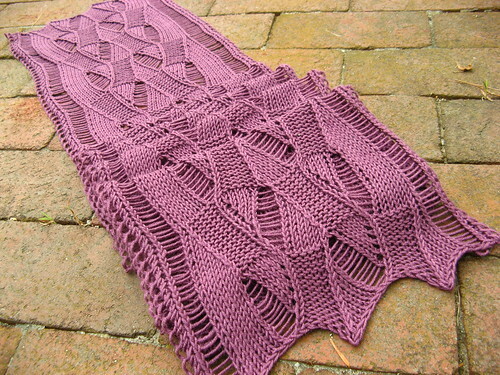 I also stopped about 10 rows early with the body — it was long enough already. I really love this top! Comfy and cute. The Ultra Pima has been a dream to work with — soft, pliant, and not at all like most cottons I’ve worked with. Definitely going to use it again!